Oh man. 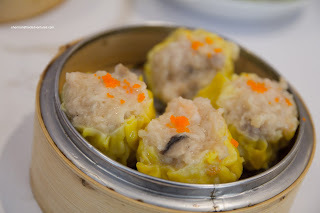 The mother-in-law wanted to go for Dim Sum again... Usually, I need to get myself mentally prepared to endure that 2-hour torture. Okay... breathe deeply. Accept that there will be a lot of yelling. A LOT of yelling. At her husband, at us, at the wait staff and even random strangers. Accept that there will be a lot of complaining. About the food, her husband, the guy who sold her a new couch, random people and why not, the whole world. A LOT of complaining. Accept that people in the restaurant will be staring at our table. A LOT of staring. From people around us, from my kids (wondering who is this crazy woman at our table), from people at the other end of the restaurant and probably from the kitchen as well. Okay, I was ready. Ready for the ordeal. The destination? Hell. Er... 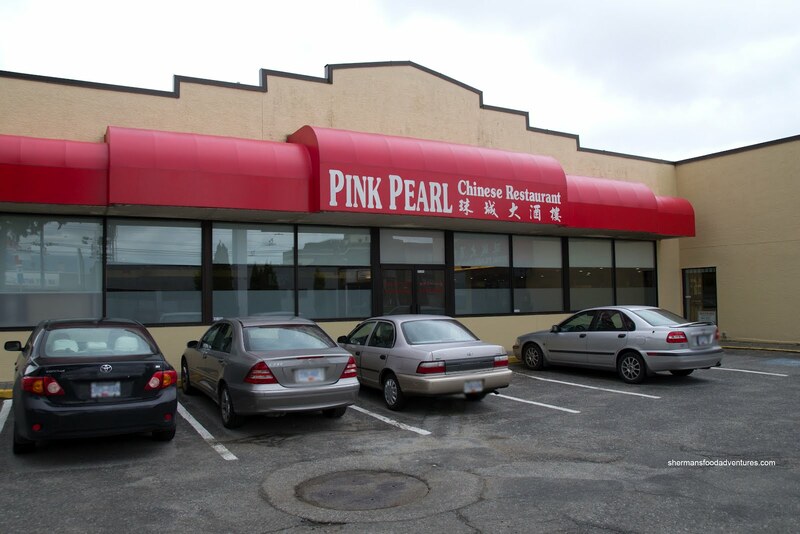 I mean Pink Pearl. After a kitchen fire (ironically) that closed the place for nearly 2 years, it is back up and running. 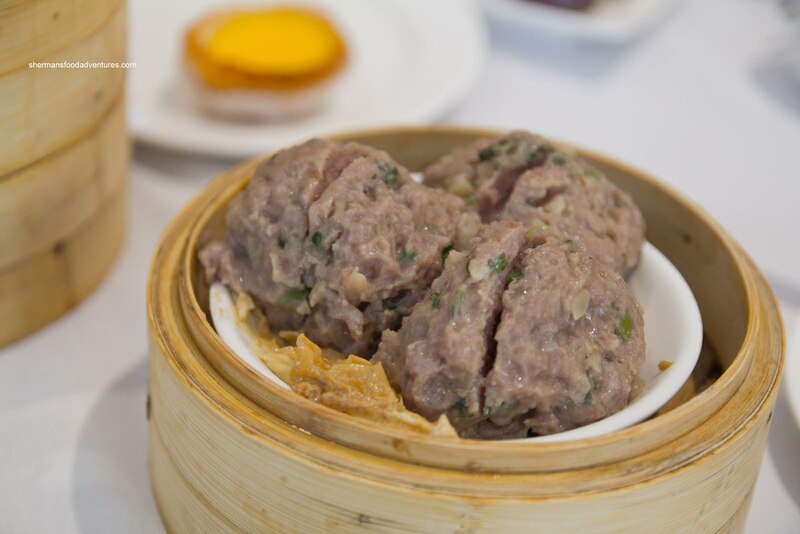 This Vancouver institution used to be one of the only places for Dim Sum, but with so many better choices, it has been mostly forgotten. We arrived just as it opened which meant that the push carts were not running yet. Hence, we ordered off a checklist with only the regular Dim Sum available. We had to wait until 10:00am to order the specialty dishes. It would've been nice if they had put that information on the sheet... More on that later. 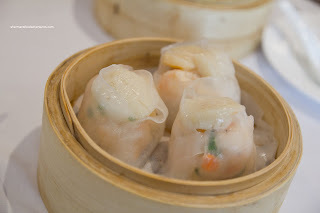 So I'll start with the standard - Haw Gow (steamed shrimp dumpling). 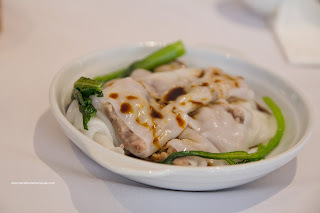 As evidenced in the picture, the skin was somewhat wet and in fact, broke apart on one of the dumplings. 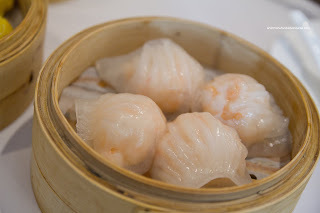 The whole shrimp filling had a nice bounce texture, yet was pretty bland in terms of seasoning and natural sweetness. 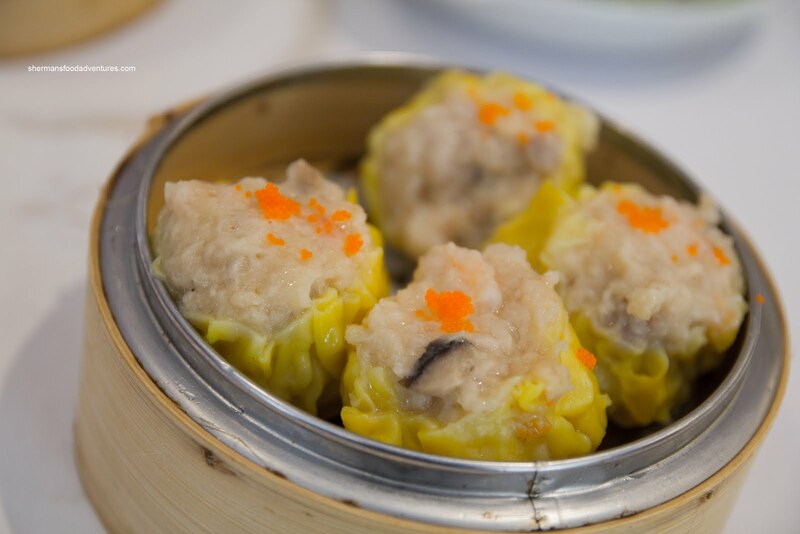 The Sui Mai (shrimp & pork dumpling) were large and full of well-marinated pork, crunchy shrimp and shiitake mushrooms. The pork benefited from a good amount of fat to achieve its bouncy texture. Some people might find it off-putting though. In terms of flavour, it was also quite mild and could've used some more seasoning. Next up was the Beef Meatballs which were also quite large. I would normally make a "ball" joke here, but at this point, my head was hurting from all the yelling. Most importantly, I was hiding my head from complete utter embarrassment. I'd rather suffer the yelling from Dragon Lady at Po King than this! In fact, I would like a puck to the head instead. I think I got a concussion from all that yelling. Oh right, and the beef meatballs had the desired bouncy texture with a touch of chewiness. It was also quite mild with a good amount of crunchy water chestnuts and just enough cilantro. 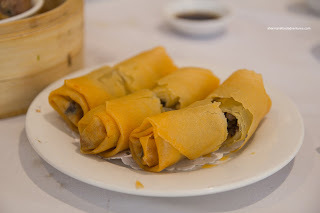 With a similar beef filling, the Beef Rice Noodle Roll was not bad. The rice noodle was fairly soft while the beef was plentiful and tender. I know this is a minor issue, but the darn thing was plated haphazardly with a pathetic sprig of yau choy on one side. Off to some more daring eats (to some, not us of course!) was the Phoenix Talons (aka chicken feet). These had a good texture which featured soft skin with plenty of gelatin and soft cartilage underneath (sounds yummy eh?). The flavours were discernible too with a good amount of garlic and sweetness. 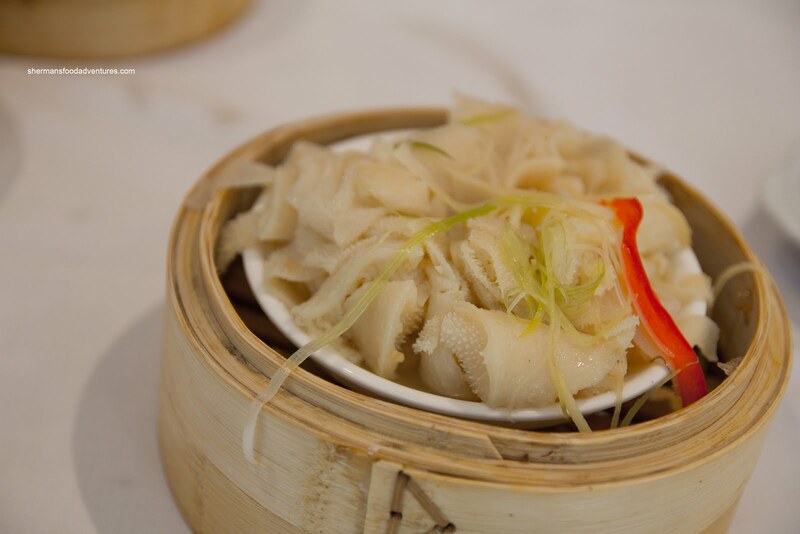 For our obligatory offal dish, we got the Steamed Bible Tripe (omasum tripe) with ginger and green onion. 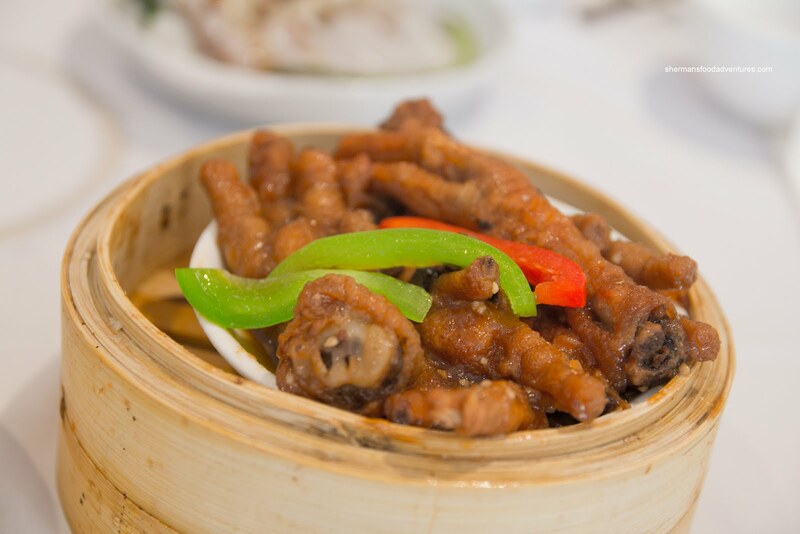 It had a chewy texture that was still tender enough to eat comfortably. There was no need to gnaw at it. The pieces of tripe were quite large and not gamy at all. However, I found it bland as none of the seasoning and other ingredients seemed to have any impact (despite being in plain view on top). Onto Viv's favourite - the Stuffed Eggplant. This was a large portion consisting of bouncy shrimp mousse which was well-seasoned. 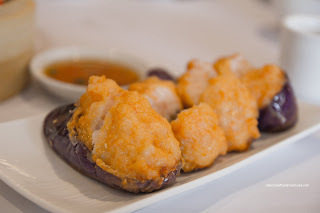 It could've been toned down a tad since it overwhelmed the natural sweetness of the shrimp. The eggplant was soft while not mushy. Okay, the award for worst dish of the meal had to go to the Scallop & Shrimp Dumplings. These pathetic things were not very fresh tasting. The shrimp were overcooked and rubbery. Moreover, the dumpling skin was hard and dry, yet at the same time, the dumpling was wet. Very strange textures going on. We weren't sure if these were freshly made to begin with. However, that is just speculation. On a positive note, the scallops were okay though. As my son was still waiting for the curiously absent rice noodle rolls (which we ordered when we first got to the restaurant), we got something to keep him busy in the Spring Rolls. 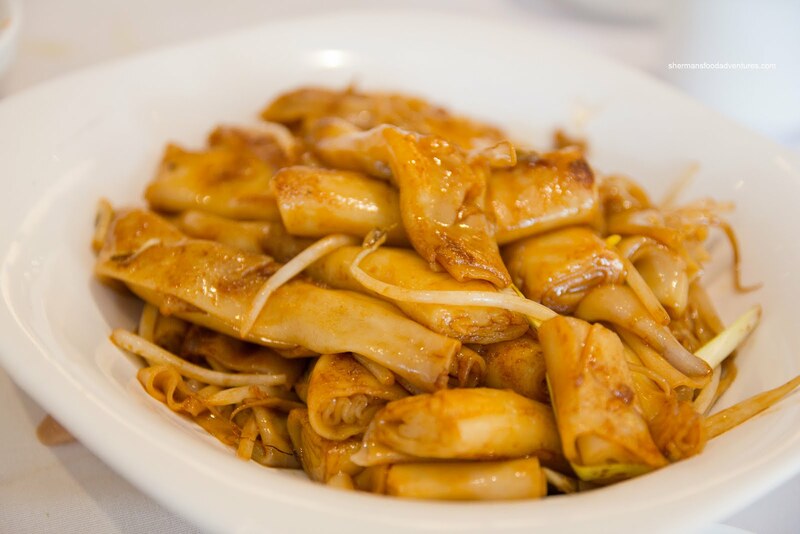 These were not the modern all-shrimp version, rather, they were completely ol' skool with pork, wood ear mushrooms and bamboo shoots. There wasn't a lot of filling per se which actually made the spring rolls light. They were not greasy and were very crisp. 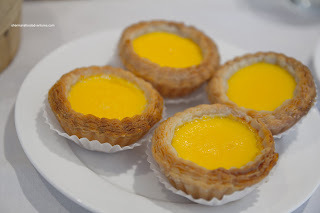 Now, we really didn't get the Egg Tarts near the end of the meal. As usual, it arrived mid-meal (if you look at the picture of the beef meatballs, you'll see it on the table). So consider it a sweet intermission of sorts. Can't really blame the restaurant as these are baked in batches and need to be eaten fresh. These were pretty good with a flaky shell which exhibited a good level of "bakedness" (much like some people on 4-20... ahem...). The egg custard was smooth and quite sweet. We already decided to settle the bill since the Soy-fried Rice Noodle Rolls had not arrived even though we had ordered it nearly an hour prior (apparently, the dish is not available until after 10:00am). Well, as we were paying, it showed up. Just like we suspected, they waited until there were a few orders before they prepared it. Our dish came out with several others on the same platter. Now, that is an efficient way to cook, yet not a great thing for the waiting customer. At the very least, give us the heads up or put down on the menu that the item is only available after 10:00am. Leaving us guessing and annoyed is not the way to go. The noodles were not bad. It could've been fried a bit longer for some colour and caramelization. At least there wasn't too much grease. So the newly reopened Pink Pearl doesn't deviate much from the old version. Food is pretty average, but serviceable. There are the faithful that will keep the place full, I'm not one of them though.